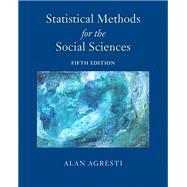 For courses in Statistical Methods for the Social Sciences . Statistical methods applied to social sciences, made accessible to all through an emphasis on concepts Statistical Methods for the Social Sciences introduces statistical methods to students majoring in social science disciplines. With an emphasis on concepts and applications, this book assumes you have no previous knowledge of statistics and only a minimal mathematical background. It contains sufficient material for a two-semester course. The 5th Edition gives you examples and exercises with a variety of “real data.” It includes more illustrations of statistical software for computations and takes advantage of the outstanding applets to explain key concepts, such as sampling distributions and conducting basic data analyses. It continues to downplay mathematics–often a stumbling block for students–while avoiding reliance on an overly simplistic recipe-based approach to statistics. Alan Agresti is Distinguished Professor in the Department of Statistics at the University of Florida. He has been teaching statistics there for 30 years, including the development of three courses in statistical methods for social science students and three courses in categorical data analysis. He is author of over 100 refereed article and four texts including "Statistics: The Art and Science of Learning From Data" (with Christine Franklin, Pearson, 4th edition 2017) and "Categorical Data Analysis" (Wiley, 3rd edition 2012). He is a Fellow of the American Statistical Association and recipient of an Honorary Doctor of Science from De Montfort University in the UK. In 2003 he was named "Statistician of the Year" by the Chicago chapter of the American Statistical Association and in 2004 he was the first honoree of the Herman Callaert Leadership Award in Biostatistical Education and Dissemination awarded by the University of Limburgs, Belgium. He has held visiting positions at Harvard University, Boston University, London School of Economics, and Imperial College and has taught courses or short courses for universities and companies in about 20 countries worldwide. He has also received teaching awards from UF and an excellence in writing award from John Wiley & Sons.